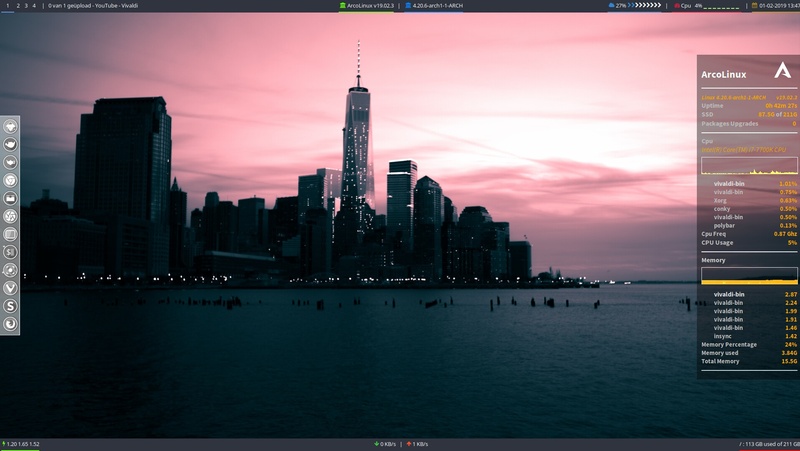 Polybar can be installed on different desktops. It is a personal choice. Polybar is fun since it has so many modules. You can make it transparent. Before we build polybar we make sure we will use all the cores of your cpu. We run the script in ~/.bin/main/000-… in order to use all all cores. We show you where yay builds its packages. We go to ~/.config/openbox/autostart and tint2 will be replaced with polybar. In ~/.config/polybar/launch.sh we make sure that the second bar is active. We delete the hashtags. Log out and log back in and you will have 2 bars. Then you can start changing the modules.